Sylvia attended a special ciphering school that was taught by a Mr. Botsford. Sylvia made a pair of shoes in mere hours as she then "knit the rest of the day". In addition to attending meetings three times, she also swept the meeting house one day. Sylvia attended a ball on Christmas Eve at a Mr. William A. Mitchael's house. Two balls in as many months, it must have been quite exciting for her! By far, Sylvia's most wrote about activity was once again knitting (18 mentions this month). Sylvia started documenting her candle making this month. While it is only mentioned three times, it is yet another skill she has. Have you been following along as I tweet my 5th great grandmother's diary? If not, head on over to @SylviasDiary and catch up on her story. Each tweet is one of her short diary entries and it is tweeted 210 years to the day after she wrote it. I have been on a quest to find a name of a village or region in Norway where Hans and/or Antonette were born. To help this along, I have been ordering a series of records that might list a hometown. You can read about these here and here. This record was ordered as part of this quest. Olga Hanson is the daughter of my GGG-Grandparents Hans and Antonette Hanson who lived in Five Points, Akan, Richland, Wisconsin. The only documents I have on Olga are a series of US Census records that list the family. This post will focus on the details of Olga's birth. If Olga had a middle name, it was not record on this delayed birth record. She is listed as a white male in this record, even through she was a white female. Gunda had several older siblings, but none of them are listed on this record. The birthplace of her parents is listed as Norway. Still no village name. The certificate was created on 7 Nov 1893 and filed on 10 Nov 1893. These are the same dates as other vital records for the family. Gunda Hanson is the daughter of my GGG-Grandparents Hans and Antonette Hanson who lived in Five Points, Akan, Richland, Wisconsin. The only documents I have on Gunda are a series of US Census records that list the family. This post will focus on the details of Gunda's birth. If Gunda had a middle name, it was not record on this delayed birth record. Anna Hellen Hanson is the daughter of my GGG-Grandparents Hans and Antonette Hanson who lived in Five Points, Akan, Richland, Wisconsin. The only documents I have on Anna are a series of US Census records that list the family. This post will focus on the details of Anna's birth. I never new Anna's full middle name and now we know it is Hellen. She was a white female. At the time of her birth she was the only child of Hans and Antonette Hanson. The birthplace of Anna's parents is listed as Norway. Still no village name. Ask any of my Miller cousins what their favorite family meal is and they will say "Grandma's Stringy Meat". The rest of the world calls it pot roast and I'm not sure how it became G-Ma's Stringy Meat, but we love it just the same. Grandma Miller has been making it for as long as I can remember. It is the meal of Sunday dinners, family celebrations, and welcome home. Most of the family has tried to replicate it at one time or another, but no one can make it taste the same. She just must cook with more love than the rest of us. Brown roast in 2 Tbsp vegetable oil. Sprinkle roast with 2 tsp. salt, 1/2 tsp. pepper, 1/2 tsp dried thyme. Put seasoned roast in a dutch over. Add 2 cups of water and 1 bay leaf. Simmer for 2 1/2 hours. Add carrots, potatoes, and onions. Simmer for 45 minutes longer. After many attempts, I have a version of it that my husband and I like a lot. We have an electric stove in our apartment and a dutch oven works best with gas in my personal opinion. So, I've started making in our crock pot and I've made two changes to her original recipe. The first is that instead of 2 cups of water I use 32 oz. 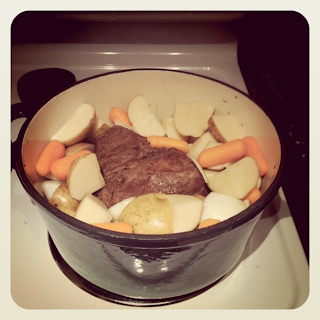 of Swanson Beef Broth and the second is that I cook it for 4 hours on high (add carrots, potatoes, and onions 2 1/2 hours in). Family Recipe Friday is one of the many blogging prompts supported by www.geneabloggers.com to help genealogy bloggers record their family histories. Hilda Maria Hanson is the daughter of my GGG-Grandparents Hans and Antonette Hanson who lived in Five Points, Akan, Richland, Wisconsin. The only documents I have on Hilda are a series of US Census records that list the family. I recently ordered Hilda's birth record. I never new Hilda's full middle name and now we know it is Maria. As with the previous records, the names of the other issue living are Anna H., Joanna A., and Magnus. Just like in Juliane's birth record, Antonette it is spelled Antonetta. The birthplace of Hilda's parents is listed as Norway. Still no village name.